Nazareth coach, Kevin Broderick watches the young players practice form during his shooting clinic. Youth basketball coaches and current varsity players volunteer to coach the spring clinic. Each morning, the kids practice correct shooting technique. Director Sean Broderick introduces Robin VanSchneider to talk to the group, the all-time leading scorer for varsity women’s basketball in Fulton. Director of Fulton Youth Basketball, Sean Broderick speaks to the players before beginning the spring clinic. Nazareth coach, Kevin Broderick teaches the fundamentals of shooting. The kids separate to baskets to practice using the correct shooting form as taught by Kevin Broderick. Nazareth coach, Kevin Broderick shows the young players at the clinic proper shooting form. FULTON, NY – The third year of Fulton Youth Basketball’s spring clinic brought an impressive roster of Fulton native basketball success stories to share their knowledge of the sport with today’s dedicated young players. Roughly 65 players from grade levels pre-kindergarten through sixth grade attended the three day clinic over spring break, growing steadily from prior years, said director of Fulton Youth Basketball, Sean Broderick. This year, the clinic offered two hometown basketball experts to speak to the group and host a shooting clinic. 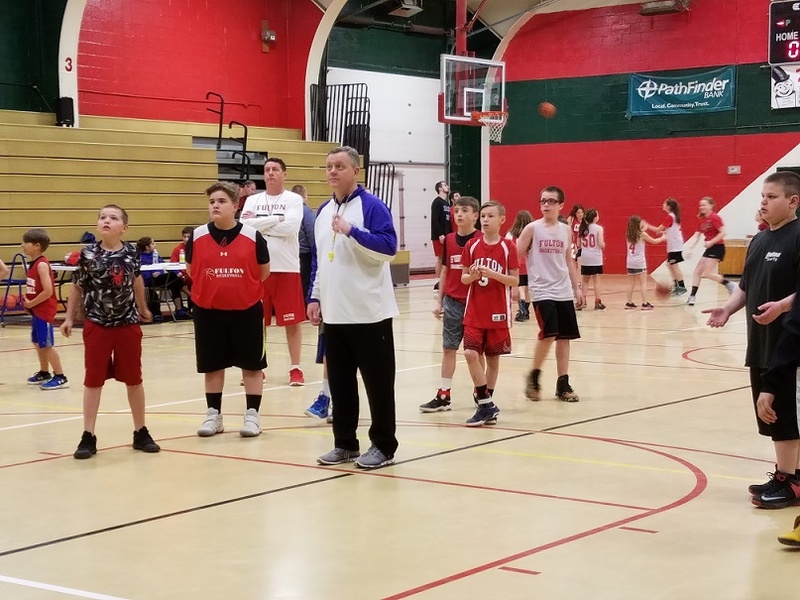 Robin VerSchneider, the all-time leading scorer for women’s varsity basketball in Fulton and Kevin Broderick, current Nazareth College men’s basketball coach and former record setting coach at SUNY Oswego spread their expertise among the eager players. VerSchneider, having scored 1,212 points in her varsity career at G. Ray Bodley, was also a trailblazer for women’s basketball in the city of Fulton after she became the first girl to demand that the city’s youth basketball program be inclusive to girls. In the fifth grade, after years of asking to join, VerSchneider recruited one other friend to become the first girls to play in Fulton’s youth basketball program, Knee High, paving the way for today’s program which is fully co-ed for grades pre-kindergarten through sixth grade. Her basketball success continued through her schooling and granted her the opportunity to play collegiate level basketball at a prestigious ivy league school, Yale University graduating class of 1994. Today, she remains local to CNY as a geologist by trade while also embarking on a new venture to make cider with her husband at a local apple orchard, Abbott Farms. However, her basketball career continues even if she’s no longer a player in the game. Currently a referee for high school level basketball and AAU, as well as junior college women, and Division 3 women, VerSchneider just found out she will be officiating Division 2 women’s college basketball this upcoming season. “It’s my dream to officiate Division 1 women’s collegiate level so here I am, age 45, and setting another basketball goal that I’m working toward,” she said. She shared some of the many lessons she learned along the way such as teamwork, academic importance, goal setting, perseverance, and dedication to the sport. The biggest lesson she hoped young players can take away from her experiences however, is the importance of putting in the work on their own time. “You need to play as often as you can, you can’t get good just by playing games. That’s the fun part but to really get good, you’ve got to put the time in on your own,” she said. VerSchneider was thrilled to be back to her old stomping grounds, and was impressed with the clinic and what it offered the youth of the Fulton community. “I have super fond memories of growing up playing basketball in Fulton. There’s so much community support here and I think it’s great how they’re revitalizing this youth basketball program again. It’s a great organization and they’re really doing it right, not just focusing on games but working on the skills they need to improve as an overall player,” she said. The following day, kids at the clinic had the opportunity to learn proper technique through a shooting clinic from another Fulton native with a successful basketball career. Kevin Broderick, brother to Sean Broderick, won a state championship in high school, played college basketball at Nazareth college, won the small school player of the year award, and coached at all levels of collegiate play including his thirteen year run as men’s basketball coach at SUNY Oswego where he holds the record for most wins of all time. Kevin currently coaches the men’s basketball team at Nazareth College who have three Fulton natives on the roster including Cody Green, Chris Jones, and Kevin’s son, Brendan Broderick. Green and Brendan, he said, are the best shooters on the team, and he used these two to help host a shooting clinic by demonstrating proper shooting form and drills to practice. “We’ve got three kids on our college team from Fulton, which doesn’t happen often and it doesn’t happen unless you’re doing things like this on your break to improve,” he told the young players, ensuring them that if they continue putting in their best effort, they too can play in college. Kevin was interactive with the kids, showing them the proper technique for shooting form and personally instructing them to correct mistakes or praise their successes. The most important lesson he hopes the kids took home, in fact, was the importance of learning the proper fundamentals at a young age to develop as a successful basketball player. “I know they do that here in Fulton, and I enjoy doing clinics like this where it’s pure fundamentals. We have three Fulton players on our team that learned these fundamentals right here and I think that speaks well to how much community involvement there is with the youth basketball program here,” he said. Kevin and Sean Broderick grew up playing basketball all over Fulton including at the War Memorial, the CYO, and local outdoor courts with many friends including VerSchneider and that was passed along to their sons. Sean Broderick said this is part of the reason he accepted the director position for Fulton Youth Basketball three years ago. “It’s been something I knew I always wanted to do, and when the former director, Jerry Schremp, approached me regarding his retirement, it just seemed like perfect timing. Jerry had built such a great program that I knew I would enjoy being able to take it over,” he said. Sean was pleased with all aspects of the clinic this year and especially with the guest speakers they were able to host. “It has been outstanding. We’re so lucky, the kids especially. Robin VerSchneider is an absolute success story that has kept basketball in her life and she’s from right here in Fulton and Kevin, he’s the best coach I’ve ever been around. Even though he’s my younger brother, he’s taught me a lot working together for 13 years at Oswego. He’s a real clinician that really stresses fundamentals so it was perfect for our kids to hear from a great college coach,” he said. Current Fulton varsity coach for the boys team, Matt Kimpland, and for the girls team, Derek Lyons, were on hand at the clinic as well. “Our varsity coaches are really engaged in our youth program and I think we can see that we have the future Raiders in our gym now. By getting to know these players at a young age, it only benefits our kids and program,” Sean said. The community support comes full circle as the city provides the building that houses the Fulton Youth Basketball program and the program is run majority in part by community volunteers. “We’re lucky to have this facility so we can do these types of things, so I really want to thank the city for that. Our coaches and our players alike are so diverse, and I think it makes the coaches more relateable to the players. We are thankful for our great volunteers or we could never do this,” he added. Sean is hopeful the clinic, much like the Fulton youth basketball program, will continue the growing trend of getting bigger and better with each passing year.